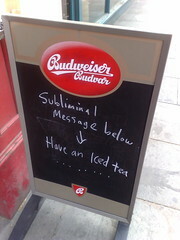 Here’s a scary thought for you: subliminal messages work. Not all of them, and not on all of us, but an increasing number of studies have found them to be effective in changing our perceptions, ideas and opinions – without our knowledge that any persuasion is taking place. Here’s an example. A group of French researchers recently asked students to participate in a study of visual attention, in which they had to indicate which of two shapes they saw in a quick flash on a computer screen. What the participants didn’t know was that before each flashed shape, half of them were also shown the word “trust” or a related word (such as “approve”, “accept” or “agree”) for about a thirtieth of a second – too quickly to be detected. The other half of the group did the same experiment without being shown the words. After they finished, the students were asked to read a message promoting tap water consumption, then answer questions about the message, its source and their future water drinking intentions. Compared with the participants who hadn’t been exposed to trust-related words, those who saw the subliminal words agreed more strongly with the tap water message and perceived the supposed source of the message to be both more likeable and more trustworthy. They also said that they planned to drink more tap water and buy less bottled water in the future. The French study isn’t the only one of its type. A 2007 study found that a subliminal image of the Israeli flag had a moderating effect on the opinions of Israelis on both sides of the Israeli-Palestine conflict, even affecting the way individuals voted in the next election. So, apart from spending the rest of your life stumbling about with your eyes closed, what can you do about this? Or, for that matter, with this? If you want to prevent subliminal images from affecting you, try making “if-then” plans (“If this happens, I will do that”). Subliminals are a form of priming (previously discussed here) and a new study found that such plans partly or completely blocked the effects of priming on participants’ behaviour. If you want to make the best use of this research yourself, don’t bother trying to create subliminal messages, even if they’re legal where you live. Chances are very high they won’t work. But you might consider the concept of trust and whether there are ways to make your audience think about it. If your organization is trustworthy, it can’t hurt to emphasize that where you can. And if your organization isn’t trustworthy, please don’t tell me. It would just make me sad. * In fact, subliminal advertising has been banned in Australia, Canada, the United Kingdom and the United States – despite the fact that its chequered history includes at least one hoax and a lot of experiments with negative results. 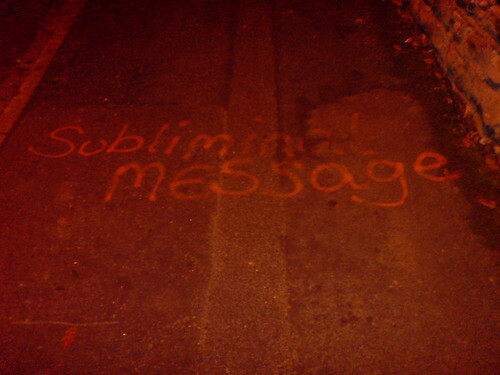 Subscribe to comments with RSS or TrackBack to 'In subliminals we trust'. Am I correct in thinking that if the word “trust” had been displayed for a longer period of time so that it was consciously perceived, it would have been subject to some thought process and rendered ineffective? What I don’t understand is how our brains can observe the word for long enough to “read” it, and assign the correct meaning to the word, but somehow still not consciously perceive and process it. What part of the brain processes these subliminal messages, does anyone know? I think there’s been some research on that, but I don’t have it at my fingertips. Let me do some searching and get back to you. It’s a good question!